Blade thickness: 6.7 mm at base, 5.1 mm middle, 3.8 mm at tip. 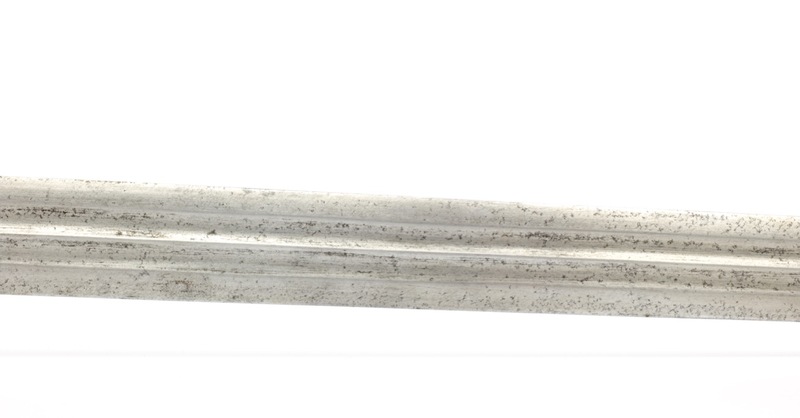 Blade width: 30.3 mm at base, 26.7 mm middle, 20 mm at tip. 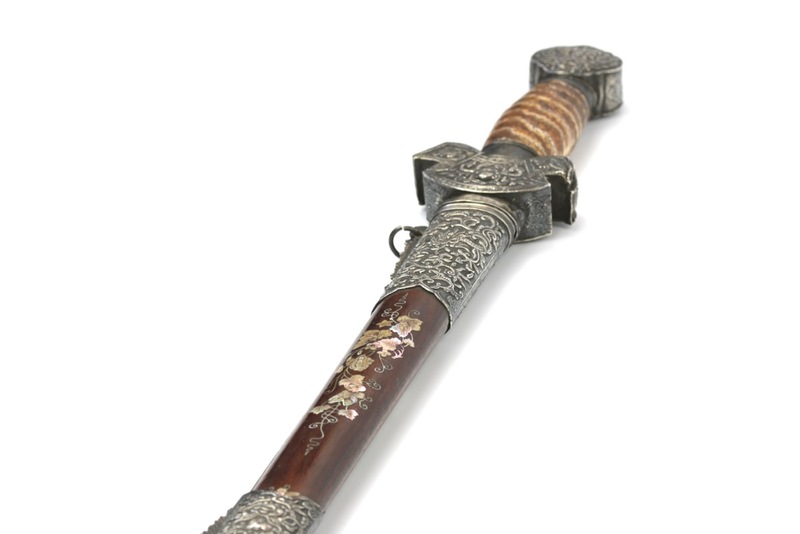 A nice kiem or "straightsword" of the Nguyen dynasty. 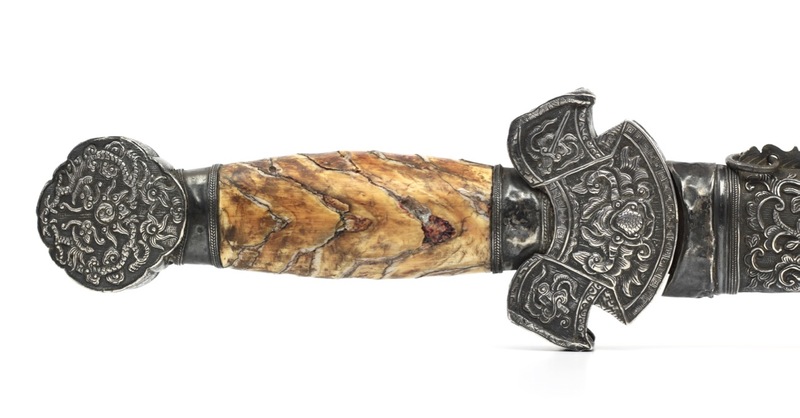 Unlike most of these that have a thin and purely ceremonial blade, this example is built around a substantial fighting blade. 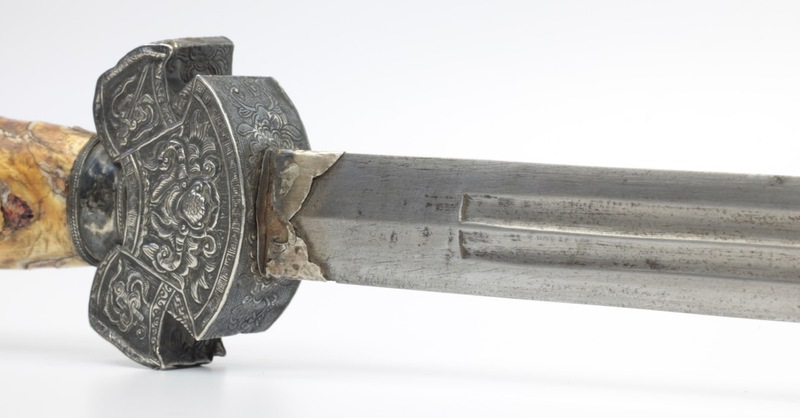 The blade is of flattened diamond cross-section, with two grooves flanking the central ridge on each side. 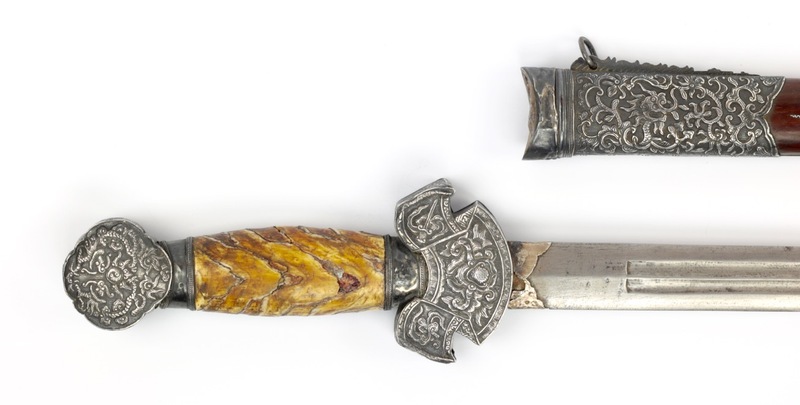 Blade in very good, original condition with no nicks, cracks, pits or areas of excessive polishing. 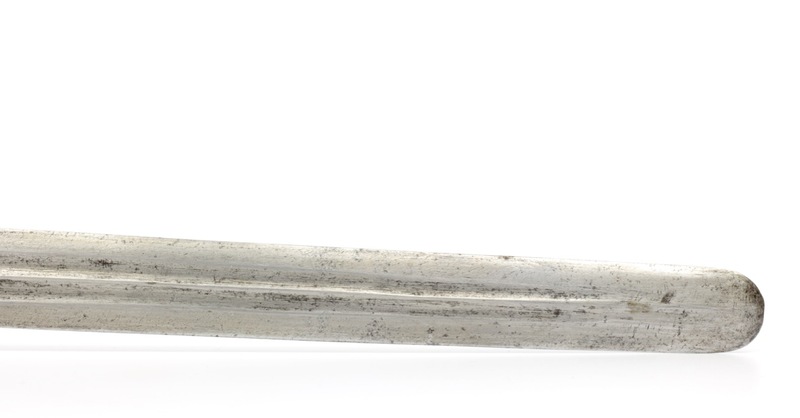 Blade keeps its original contours and bevels and is very straight. 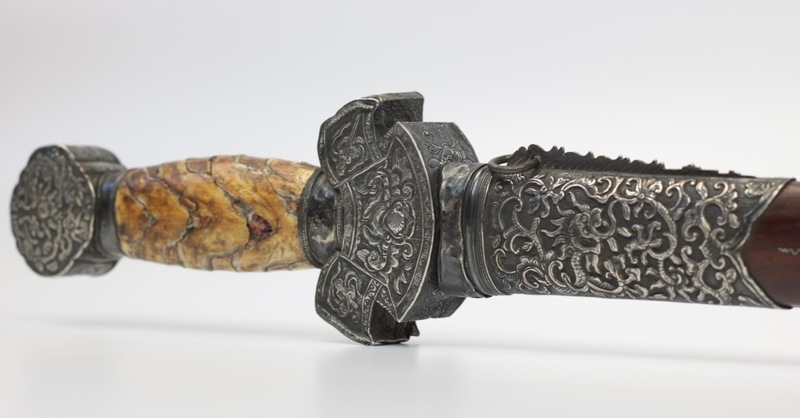 In typical Vietnamese fashion, it has a silver sleeve at the base of the blade. 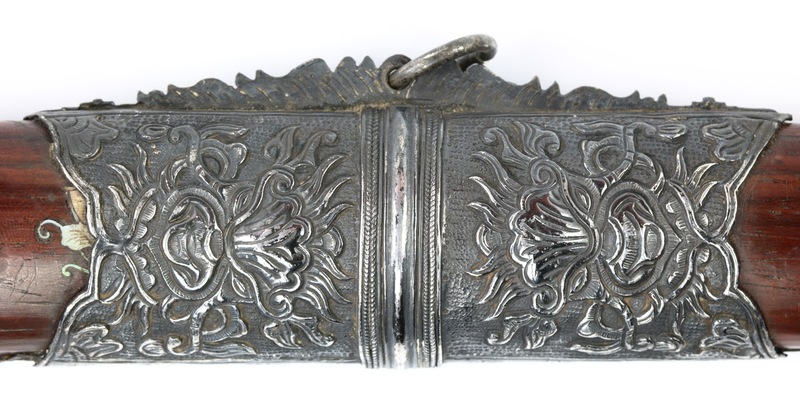 All fittings are of silver sheet, elaborately worked in repoussé and chiseled from the observe to add crispness of detail. The work is exceptionally fine. 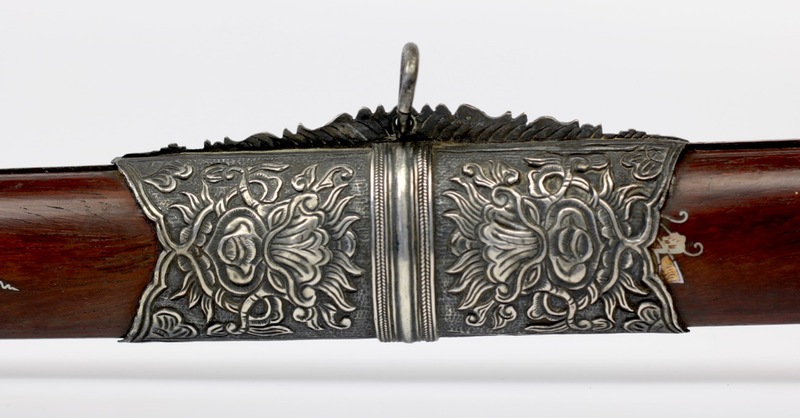 It has a very unusual hilt with a guard shaped like a folded banner. 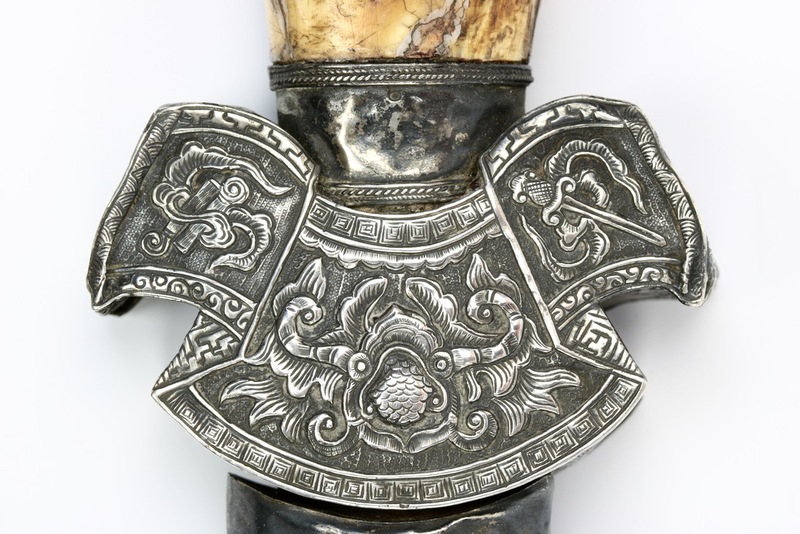 On either side of the guard is a stylized kīrttimukha ("Face of Glory"), a sword and a set of scrolls: The scholar's accoutrements. 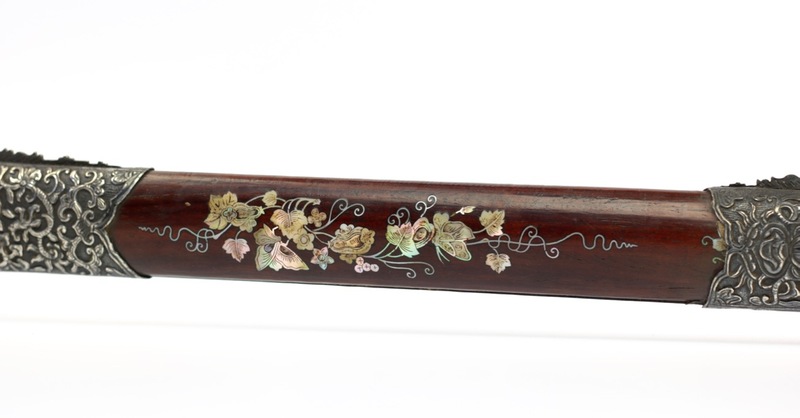 On the sides of the guard are auspicious bats (for luck) and typically Vietnamese stylized floral designs. 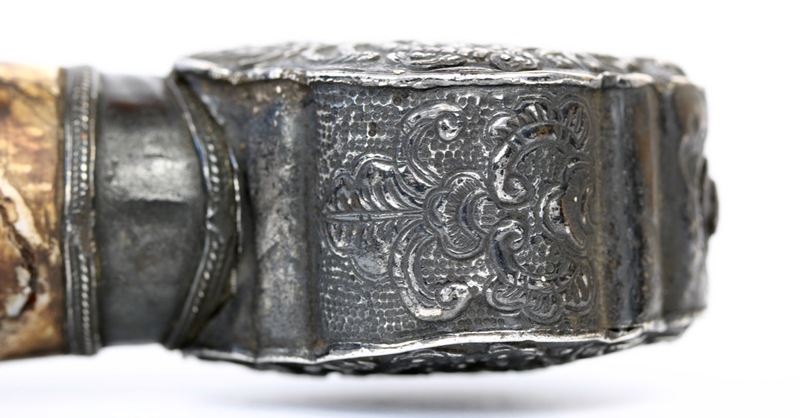 The plain ferrule is elegantly decorated with borders of braided silver wire. 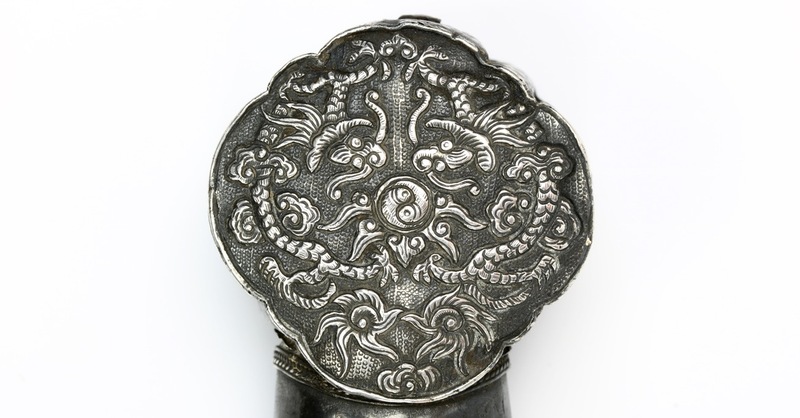 The pommel of more conventional form with two dragon on each face, surrounding a taiji symbol. 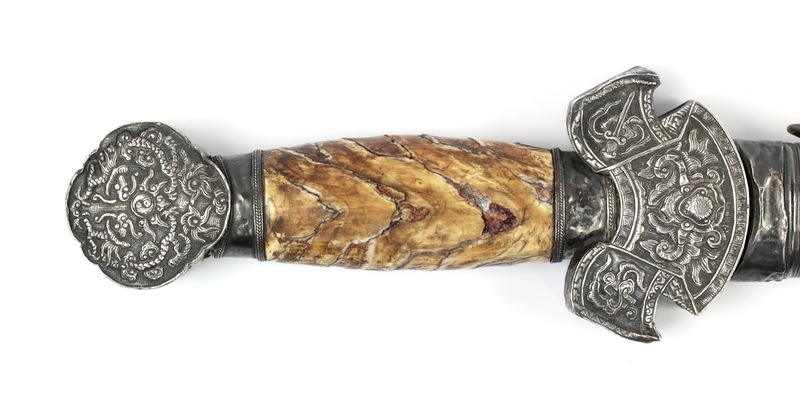 The hilt fittings enclose a handle made of the fossil tooth of a mastodon that had passed away in a swamp, the peat slowly absorbed by the material over the centuries which gives the material its characteristic striped appearance. 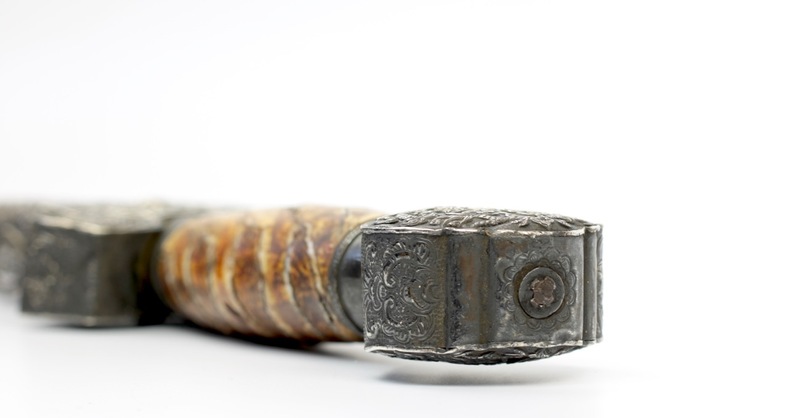 The handle cracked crosswise over its natural grain, repaired by a previous owner, but some friction in the handle remains. 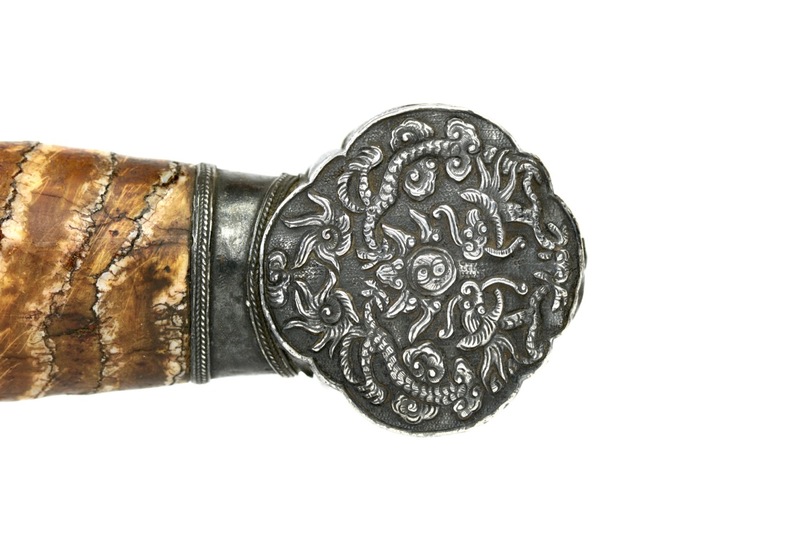 The hardwood scabbard has a beautiful deep, dark patina. 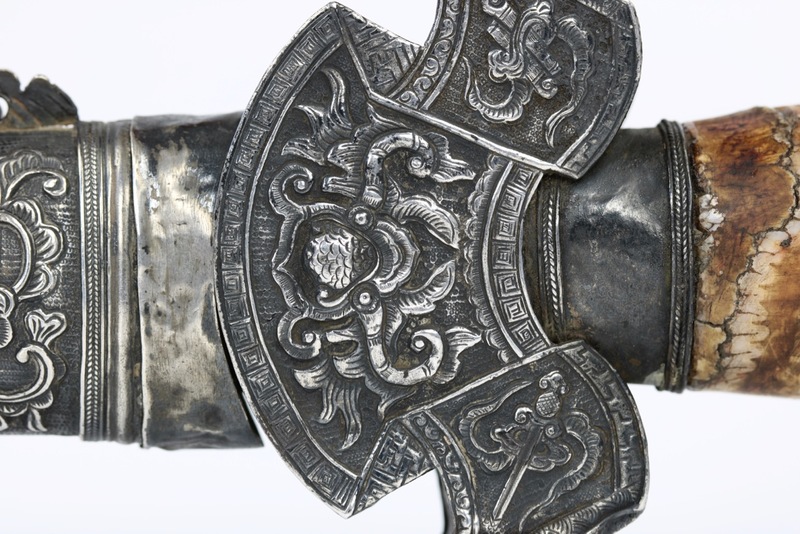 It is fitted with three fittings of elaborately worked sheet silver with designs of dragon among stylized foliage, worked in higher relief than is usual on Vietnamese swords. 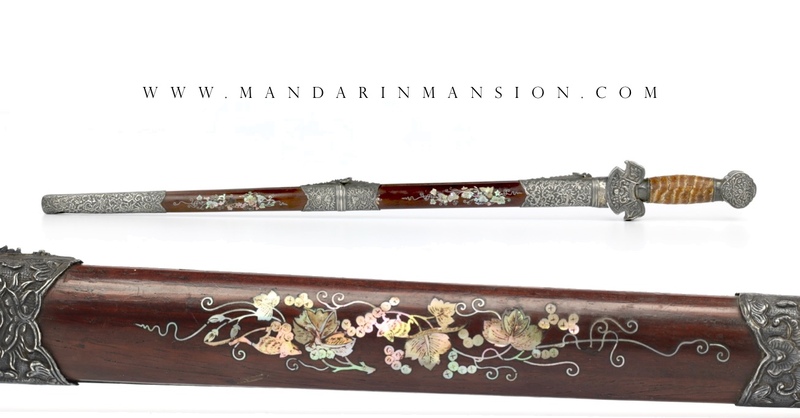 The exposed wood sections between the fittings are inlaid with mother of pearl work, something the Vietnamese excelled in. It shows scenes of vines with long, narrow tendrils, flowers, fruits like grapes, leaves and animals such as squirrel and butterlies. One leaf is lost. 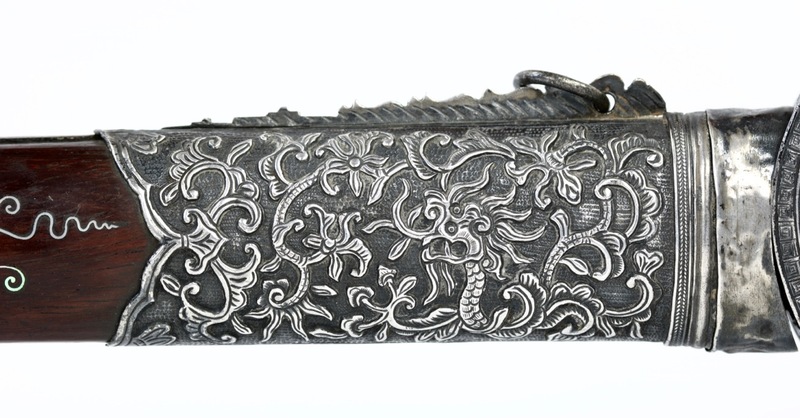 The thin tendrils show off the incredible patience and skill of the craftsman. Good work can be recognized by the complexity of the work, the delicacy and length of a single piece of tendril, and the use of little to no filler to make it fit. 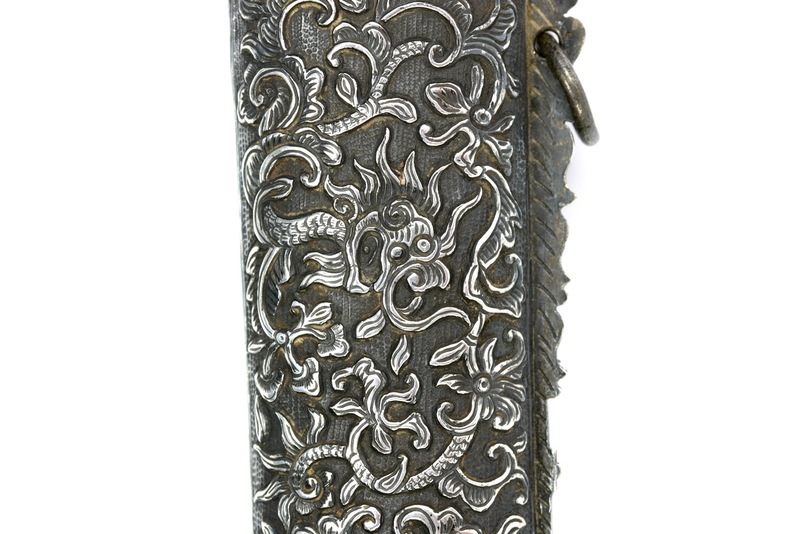 The work on this scabbard ranks among the best of this work I've seen so far, only surpassed by a ceremonial guom we also currently have for sale. 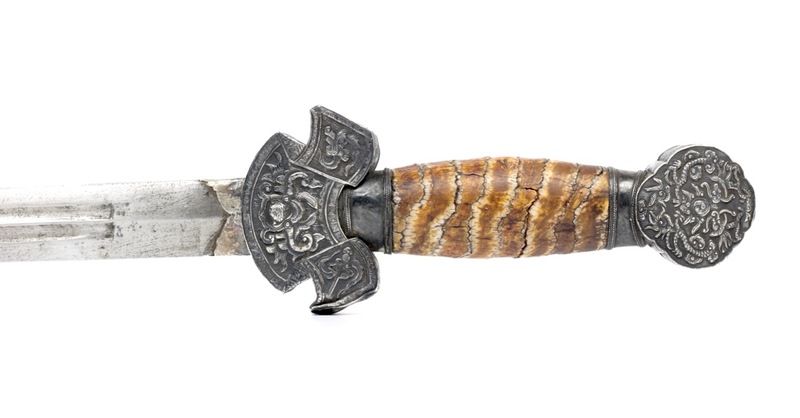 An excellent example of a Vietnamese straightsword with a substantial fighting blade. It has a most unusual guard, the only one of its type I've seen so far. 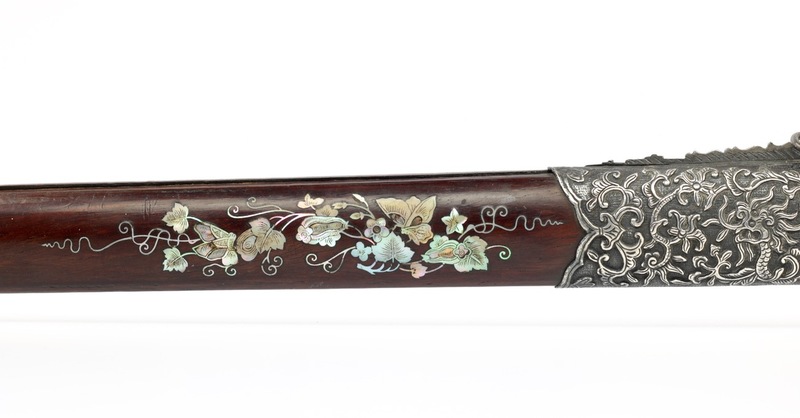 The mother-of-pearl inlays in the scabbard ranks among the best of it's type we've had.